We’re the only childcare service in Chicago that uses a personal matchmaking process to ensure families and sitters are perfect for each other. KNOW you are getting an actual professional babysitter, not someone that just likes kids and needs money. KNOW who you are going to meet and be assured that they have been screened and vetted. KNOW that our families and sitters are paired by humans, which means less work for you and promises a better sitter. You get actual support from a real person. (She) was great! I really appreciated her quick responses to our texts and how nice and tidy she kept the Airbnb we were staying at. We are very thankful to have found Chicago Super Sitters. You have made our transition from no babysitter to several babysitters wonderful! My son absolutely loves both sitters that you have placed with us and we are excited to have them come back. Thank you for making this experience stress free and anxiety free. I simply love CSS! The CSS team does an amazing job at pairing sitters with families and each and every time it’s been a great fit! They take the time to get to know each family and each sitter which is why they have such great success with pairings! I love that I can take three babysitting gigs one weekend when I’m free and also not make any babysitting commitments for the following weekend- the flexibility is amazing! Consistent flexibility, realistic expectations, super fun. I love being a SuperSitter. I have been working as a childcare provider for years and I have never felt safer or more prepared going to new homes. Tori is a truly gifted matchmaker of sitters and families and I feel very lucky to be one of her SuperSitters! I just wanted to reiterate how happy we are with all of our sitters and experiences with CSS. You choose wonderful people to represent your company who take care of our kids – including furry babies – with lots of love and patience. We’re so grateful to have found CSS years ago. Thanks for all you do! I was apprehensive about leaving my little one, especially being brand new to the city. Tori made the process easy peasy! She could not have picked a more perfect sitter. Our son took to his new friend immediately and it was as if we had known each other for a while. I will continue to use Chicago Super Sitters, and I recommend them to everyone. I am beyond pleased with their services and communication. I wish I could give 10 stars!!! CSS embodies much of what I love about working environment: woman-owned and operated, constantly looking to grow and learn, support for both employees and clients, forward thinking and inclusive. I could go on. Working for CSS provides me an opportunity to do something I enjoy while also feeling good about the company I’m a part of. Oh my goodness, my daughters loved (the sitter)! When i got home from a 2 day trip, she was happy to see me but really just wanted me to go to work so she could have the sitter all to herself. My other daughter was at school so didn’t spend as much time with (the sitter), but did ask if she could come on a weekend sometime so she could spend with her. I really liked her as well. She was great with the girls, down to earth, very comfortable to be around. Thank you for what you do! Your service gives me peace of mind when I travel. (She) was a fantastic sitter! She was warm, friendly, and courteous, and our girls immediately warmed up to her. I was especially impressed at her effort to get to know & connect with each of our three girls, and how positive & kind she was in her interactions with them (and us!). We would love to have (her) back whenever she is available to babysit. Thank you so much for another great sitter! I wish we lived here! (The sitter) is sunshine. I was nervous that my son would have a difficult time when we walked out the door, and he didn’t even react when I said goodbye. She has such a calm demeanor that couldn’t have been a better fit… for both my kid and me! When he woke up this morning, he immediately told me that he had fun with her. If only we lived here… she would be our #1. I now work a full-time job but still remain a sitter for CSS because it is an all-around amazing organization to be apart of. Tori’s passion for what she does shows through the thorough intake/hiring process and her ongoing direct support. I love the various kiddos/families I’m able to work with and not to mention the flexibility of making my own schedule and picking up more hours with a moments notice! I love all of my Sitters! As usual with CSS, this new sitter was great! She really had great energy, and even got my son to nap! I can’t say enough wonderful things about CSS, and (this sitter) is just one example. I’d love to have her back! She was so patient and attentive to my son, who can be a handful. He loved spending time with her, and we were completely comfortable leaving him in her hands. She was up for his creative play ideas but still able to set boundaries with him in a respectful and positive way. Great sitter!! Our Super Sitters and Families both have a screening process to make sure we create great matches. Chicago Super Sitters celebrates diversity and we have options for almost every lifestyle and background, so let's get started! 95% of local Super Families who join stay with us. 75% of our new Super Families have never booked an online babysitter before finding us. 3 Years average tenure for Super Families. 3 Years average tenure with CSSitters. 3 Years minimum childcare experience before joining our roster - our Super Sitters are pros! 80% of our sitters come from personal referrals, so we know who we're sending and you know who you're getting. Save 20% on ALL Bookings with a SuperCard! 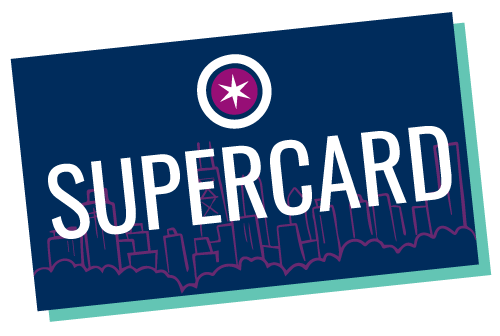 A SuperCard is an easy way to prepay your Placement Fees and make booking a lot faster. SuperCards are $200 for 10 credits, which save you 20%, no matter how far in advance you need to book your sitter.